Online applications are invited for the following posts as shown below under the establishment of the Superintendent, Gauhati Medical College Hospital, Guwahati-32 which will be available at the official website of Directorate of Medical Education, Assam from 19.09.2017 to 07.10.2017 till midnight. Educational Qualification: HSSLC (Sc) or equivalent with Diploma/ Certificate in Medical Laboratory Technician from any medical colleges of Assam/ Govt. recognized institute. 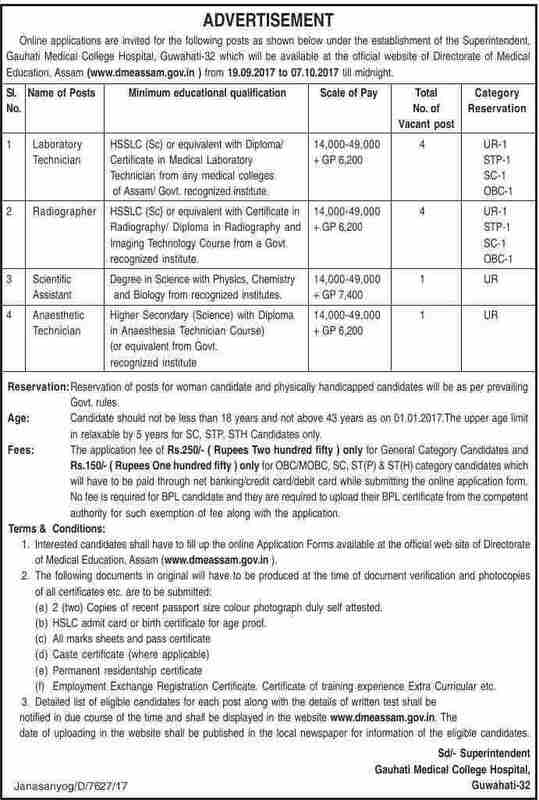 Educational Qualification: HSSLC (Sc) or equivalent with Certificate in Radiography/ Diploma in Radiography and Imaging Technology Course from a Govt. recognized institute. Educational Qualification: Degree in Science with Physics, Chemistry and Biology from recognized institutes. Educational Qualification: Higher Secondary (Science) with Diploma in Anaesthesia Technician Course or equivalent from Govt. recognized institute. Age : Candidate should not be less than 18 years and not above 43 years as on 01.01.2017. The upper age limit in relaxable by 5 years for SC, STP, STH Candidates only. Application Fee: The application fee of Rs. 250/- (Ruppes two hundred fifty) only for General Category Candidates and Rs. 150/- (Rupees one hundred fifty) only for OBC/ MOBC, SC, ST(P) & ST(H) category candidates wich will have ot be paid through net banking/ credit card/ debit card while submitting the online application form. No fee is required for BPL candidate and they are required to upload their BPL certificate from the competent authority for such exemption of fee along with the application. How to apply: Interested candidates shall have to fill up the online Application Forms available at the official website of Directorate of Medical Education, Assam (www.dmeassam.gov.in ). 1. The following documents in original will have to be produced at the time of document verification and photocopies of all certificates etc. are to be submitted. (c) All marks sheets and pass certificate.